Load away in a smart way! 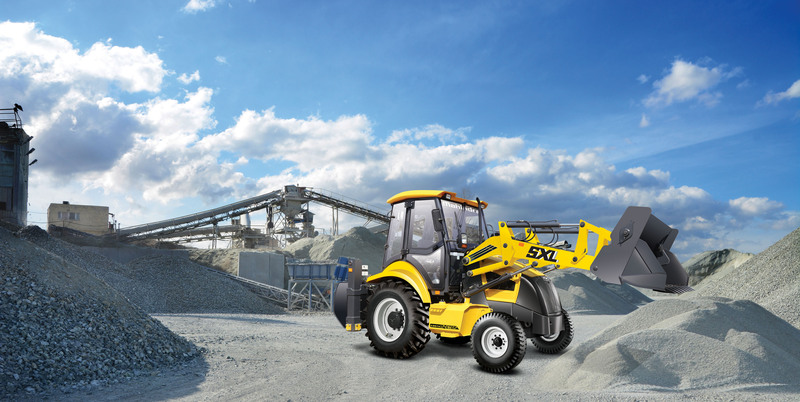 Mahindra EarthMaster SXL is an ideal heavy equipment machine for multi-purpose use in construction to move aside or load materials such as sand, asphalt, debris into the dump truck. The front-mounted square wide bucket connected to the end of two booms helps to move an assembled material from ground level and deposit it into an awaiting dump truck or shift it to other side. It has been validated on all performance, safety and reliability parameters. It not only increases your productivity but also offers unmatched fuel economy, superior style and operator comfort. Rigidly mounted drive axle, with outbound planetary final drives, driven by short drive shaft. Centrally pivoted, non-driven unbalanced type axle, with total oscillation of 16°, with remote greasing facility for the main pin. Hydraulically actuated, self adjusting, maintenance free, oil immersed multi-disc, on the rear axle, operated by independent foot pedals, joined together for normal operation. Hand operated, inbuilt in the rear axle, low maintenance. Dust proof switches, ignition controls for engine start and stop, horn and reverse alarm, water and dust proof electrical connectors. Ergonomically designed cab with contemporary styling, excellent operator comfort, day and night time visibility, rear view mirror, multiple storage options, two door access, sliding rear window, stowable doors and an integrated tool box. Cabin frame built with sturdy tubular sections and protected with CED technology for longer rust protection. Fully adjustable premium operator seat with safety belt. Excellent leg space, conveniently positioned control levers and pedals. Low line curved hood to enhance operator visibility. Rops, FOPS compliant. Front wheel hydrostatic power steering, with priority function and pressure relief setting of 145 bar.